CD review: "A Tale of God's Will (A Requiem for Katrina)"
Even very casual jazz fans likely know that New Orleans was the birthplace of the music at the turn of the last century, where ragtime came down the Mississippi River and met hot Creole and Haitian rhythms from the Caribbean in the whorehouses and bars of the Crescent City. Fewer may be aware what a vital hotbed of jazz creativity the city has remained in the years since Louis Armstrong struck out for Chicago and New York. After Hurricane Katrina devastated New Orleans, many of her native sons and daughters have been coming to her aid with benefit concerts and CDs. The Marsalis clan and Harry Connick Jr. may be the most famous faces of New Orleans' modern jazz community, but trumpeter Terence Blanchard is a well-respected artist in his own right, having (like fellow trumpeter Wynton Marsalis) played with Art Blakey's Jazz Messengers, as well as Lionel Hampton. His new opus for New Orleans, "A Tale of God's Will," is no benefit CD or fund-raiser  but serves the cause of restoring New Orleans by reminding anew what ambitious, powerful work comes from that city, how important New Orleans remains to this country's self-image and self-confidence. Drawing on both Blanchard's jazz roots and his work composing film scores, this 13-part jazz and orchestral work is stately and graceful, but in a very athletic manner. 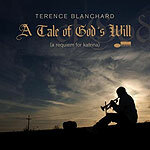 And the manner in with Blanchard blends jazz and orchestral music is utterly seamless and balanced. His muted trumpet over cellos and double bass on the closing track, "Dear Mom," is both jazz and classical at the same time  and not a watered-down blend of the two, but both jazz and classical in equal parts, at the same time, in a very strong, confident way. It's not a mere co-existence, but more of a partnership in which Blanchard uses the jazz and classical to push each other. And that's true throughout this work  much like a good sports coach must take different, perhaps even conflicting, personalities and get them to play better together than they can separately, so does Blanchard find ways of bring jazz and classical music beyond the obvious conflicts that have confounded most efforts to successfully combine them and into a place where they complement and strengthen one another. It is an amazing work, comparable to Wynton Marsalis' "In This House, On This Morning" and "Blood on the Fields."